My mandarin teacher recently invited me to accompany her back to her village for the weekend. I jumped at the opportunity. Not only because I’ll take any chance for a new insight to life in the countryside, but especially because we had discussed at length how the local government was making everyone in her village take down their pig farms. Her family doesn’t raise pigs, but they do sell the grain that pigs eat to other families in the area that do raise pigs – which seemed like everyone I met when she took me on a tour of her village to visit with relatives and neighbors. Above, a local neighbor who has worked for her parents for the past fifteen years is sifting the pig grain in her parents’ barn. She said he is basically like her uncle. Her cousin (above) does raise pigs. I know. He keeps them in those pig crates. Not to excuse it, but I doubt the large-scale pig farms bound to take the place of these family pig farms will do anything different. 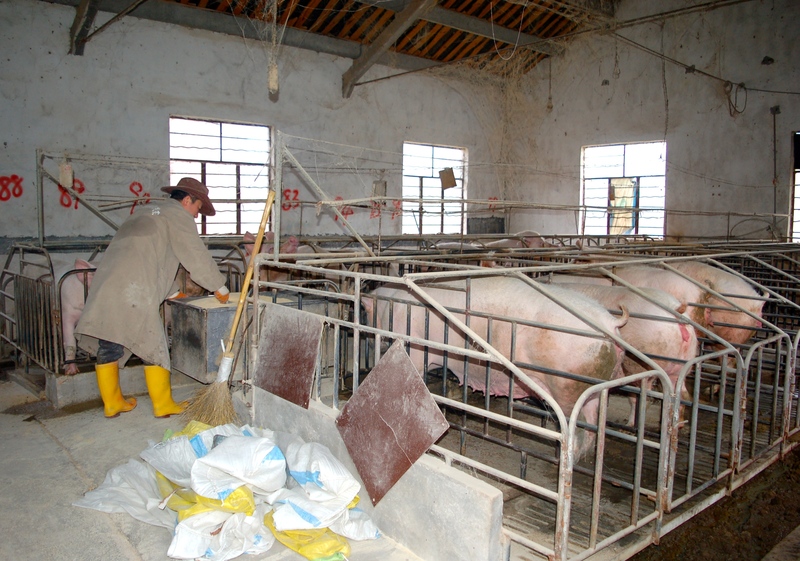 And, as my mandarin teacher said, food safety is a problem in China – their families feel safer eating the pigs they raise themselves rather than the meat they buy at the grocery store, where they have no idea what the processing conditions are like. Later, while we were chatting with her cousin in his office, I said to him that he seemed remarkably calm about the whole issue, considering they’ve been given a deadline til the end of March to take everything down. He replied that the government hasn’t yet decided whether they will give the pig farmers compensation. If they don’t give them compensation, or if it’s not enough, then they simply aren’t going to follow the new rule. My mandarin teacher said that whether the local government will give pig farmers compensation completely depends from one place to the next, but in her hometown the local government likely won’t because they simply don’t have the money. She explained that without compensation, the pig farmers will resist the new rule by banding together and collectively protesting to the higher levels of government, all the way to the provincial level if they have to. When I returned to school I spoke with a professor from Zhejiang University’s Department of Public Affairs about the whole thing. She said, “I know this is a ridiculous policy.” And then explained that this is only happening in Zhejiang because it is related to a water pollution policy that was proposed by the Provincial Party Secretary two years ago. I asked what she thought was going to happen, considering the people I spoke with didn’t seem super stressed about the prospect of taking down their pig farms, nor did preparations appear to be underway. She said she thinks local farmers are probably afraid the local government would punish them, but, on the other hand, they know that so many people are raising small-scale pig farms – everyone has them – and they know the government can’t enforce this law against all of them. So they are probably ok with waiting to see what the compensation will be, and then deciding. 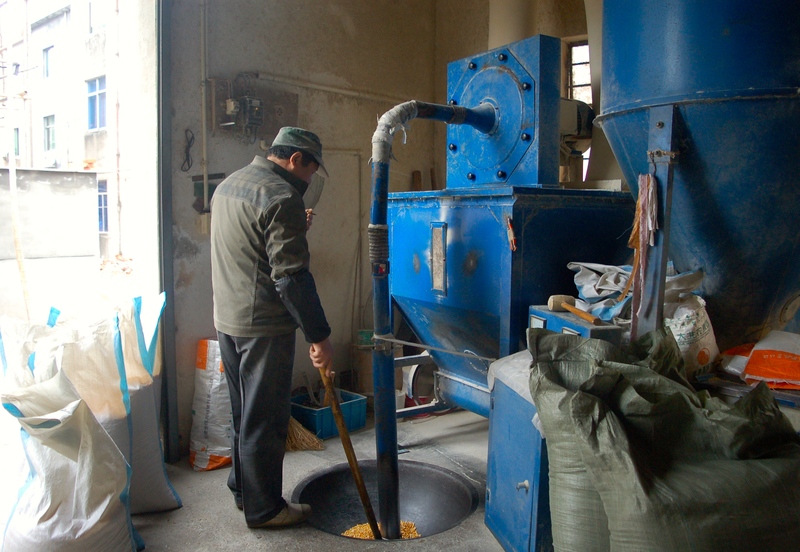 In an era of economic globalization, small-scale producers around the world have already been forced to wage a David v. Goliath market competition with their large-scale industrial counterparts. Now, as the environmental consequences of global production practices are reaching a tipping point that can no longer be ignored, the stakes couldn’t be higher for small family farmers as governments and corporations justify conservation via large-scale efficiency in order to protect the world’s elite at the cost of basic livelihoods. As an industrial platform to the world, we all benefit from China’s production of cheap goods and labor. Therefore, it is imperative that problems like these not be simply framed as the poor farmer vs. the big bad state, because that framework often assumes a market solution (like land privatization) should take the place of the state. In the subsequent institutional vacuum, transnational corporations and global elites will exploit atomized farmers for their land and labor while obliterating their collective and community institutions for local organization and resource management in a free-for-all of environmental destruction to produce the most goods for the lowest cost. We have to move beyond discussions of China-bashing or praise, and acknowledge the complex challenges to sustainability that globalization brings. Our role in these processes as consumers are often affecting the world’s people in highly destructive ways. How we frame these problems, our solutions, and our calls to action are at the heart of our fight for a better future. Muldavin, Joshua. (2013):14. “From Rural Transformation to Global Integration: Comparative Analyses of the Environmental Dimensions of China’s Rise. Eurasian Geography and Economics. This entry was posted in Zhejiang Province and tagged climate change, environment, local government, rural China. Bookmark the permalink. 1 Response to What about the Family Pig Farms?